The world is now plagued with monsters. These hideous creatures survived the banishment, hidden in secret lairs beneath the mountains. Slowly they have returned, devouring hapless travellers, soldiers and small frontier villages. Luckily, heroes have begun to emerge as well! Wielding magic and steel, they hunt these beasts. Battles are fought! Blood is spilled! Lives are lost! And courage is put to the test. Come join these heroes! Stand face to fangs with the most gruesome creatures ever enoucntered! Only your bravery,your skills and your cunning will determine the outcome. 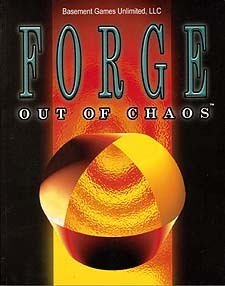 That is if you're brave enough to open Forge: Out of Chaos.